Sixty packets of sanitary napkins are far too many to distribute in a village that has 165 adolescent girls, says Sunaina Devi. It’s not that she is too lazy an accredited social health activist (ASHA) to go house to house at Konhi, her village in Bihar’s Buxar district. One packet costs Rs 6 but people want it free of cost, say ASHAs. Government provides contraceptives and foodgrain for free, so ASHAs must be making money out of it, people say. Those who do buy the product are unhappy with its quality. Murar Devi in Murar village of Buxar grieves similarly. She did not sell a single packet this month. It is important to maintain hygiene during menstruation; lack of it can lead to local infections like Reproductive Tract Infection. However, most rural girls use old clothes. 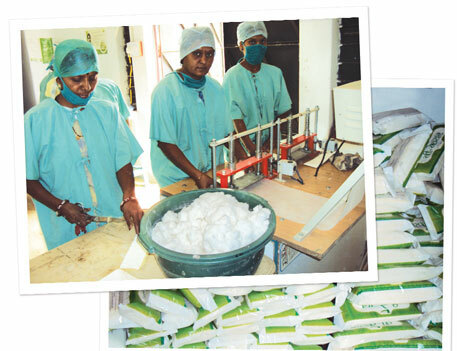 Sanitary napkins available in the market are unaffordable because of their cost, they say. Considering this, the Ministry of Health and Family Welfare introduced a scheme for promotion of menstrual hygiene in 2010 to provide low-cost sanitary napkins to 85.5 million rural girls between 10 and 19 years of age. Of these, 24.2 million live below poverty line (BPL). 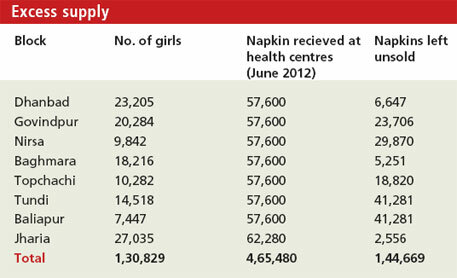 But health ministry’s data reveals that Bihar and Uttar Pradesh have not yet welcomed the scheme with 43 per cent and 39 per cent utilisation of the napkins respectively. Aurangabad, in Bihar, has recieved three consignments since 2012. Earlier, the sanitary napkins were delivered according to the population. Now a consignment reaches the district only when the first one gets sold (see ‘Poor demand’). In Dhanbad district in Jharkhand, the first consignment that came in June 2012 has not been sold as yet. Though Chhattisgarh and Odisha sold all the napkins, Uttarakhand sold 68 per cent of the products, Karnataka used 62 per cent, Assam 53 used per cent and Gujarat used 52 per cent, the ministry’s data states. The scheme is in danger primarily because of the quality of napkins, says a UNICEF official who did not wish to be named. “We get frequent complaints that the product is too thin,” says Ravi Anand Dubey, ASHA manager and nodal officer of Buxar. The girls complain that it does not last more than three or four hours, says Rekha Singh, community mobiliser in Dhanbad. Officials of HLL Lifecare Limited (HLL), the government company which manufactures napkins under the brandname Freedays, say all the napkins adhere to the standards specified by the Ministry of Health and Family Welfare. As per the standards, each napkin should be 230 mm in overall length, 210 mm in fluff core length and 65 mm in width. Its thickness should be between 8 mm and 10 mm and should weigh between 7.5 gram and 10 gram. Besides, it should absorb at least 50 ml of saline water. “We get all the samples tested at our laboratory as well as the National Accreditation Board for Testing and Calibration Laboratories,” says an HLL official asking not to be named. Clearly, government’s standards are inadequate. It was clear in the first year of the scheme’s implementation that the country is not equipped to meet the demand. In 2011-12, there was requirement of 193 million packets, while in 2012-13 the requirement was 372 million. HLL, which makes healthcare products, has the capacity to manufacture 200 million packets, but it provides them for state government programmes as well. So the Centre decided to meet the demand from self-help groups, which have been running successfully. But when big players such as Procter & Gamble and Johnson & Johnson started lobbying for contracts, the government changed track and announced biddings. These companies quoted high prices which the government could not afford. The companies which bagged the contracts were mostly from China. Now, 80 per cent of the napkins are imported. While a bulk is from China the rest is from Nepal, says an HLL official. Meanwhile, HLL supplies sanitary napkins in 107 districts through Central procurement and in 45 districts through local self-help groups. Involving the community can solve the problems government is facing at present, says Jai Prakash Soni of non-profit Living Development Society. Coimbatore-based A Muruganandam has designed a low-cost sanitary napkin maker, which, he says, can enable stakeholders run a viable and sustainable enterprise at the grassroots. The small machine costs Rs 87,000. Machines used by large-scale manufacturers cost millions of rupees. Muruganandam’s machine uses purely mechanical processes such as grinding, defibration, pressing and sealing to convert high-quality pine wood pulp into a napkin. His company, Jayaashree Industries, has equipped 758 units in 27 states. The product has been patented and he has won the best innovation award for his work. This apart, a self-help group in Indore, has established its own brand of sanitary napkins called V-Care with help from Living Development Society. A group of 10 women have been running the unit successfully for the last two years. The Department of Women and Child Development provided the women space. They bought the machine from Tamil Nadu and used raw materials such as wood pulp, protection sheet and non-woven fabric. V-Care is manufactured in three sizes. Each packet costs Rs 16. “With government help this price can be lowered and made accessible to rural India,” says Soni. The local administration helps the group sell the napkins in girls’ hostels, schools and anganwadi centres. 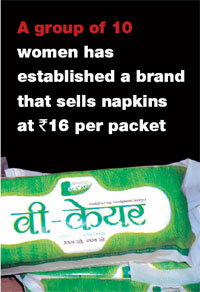 On an average, the women sell 15,000 packets in a month. With three to four working hours, the women earn around Rs 3,000 per month. Most of the women are from BPL families. At a time when ASHAs, who are entrusted with the task of implementing the scheme, get a meagre Rs 1 per packet as incentive for selling Freedays, self-help groups will ensure that their products reach maximum girls. Government should also review its programmes to reach the masses.